This X-Acto Vortex Stand-Up Electric Pencil Sharpener features a top insertion hole, carbon steel sharpened blades and easy-to-empty receptacle. The slide-out waste tray allows easy cleanup. Auto-reset eliminates motor burnout. UL listed. CSA approved. Dimensions (H x W x D): 3.8" x 2.8" x 5.3"
Transcript: This is the X-Acto Vortex Stand-Up Electric Pencil Sharpener! Pencils are inserted at the top, and the sharpener is best used at home or a small personal office. The sharpen time is not very fast, but where it lacks in speed, the trimmed wood is actually smoother than some faster sharpeners and just as sharp. The shavings receptacle is quite small, best for the use of a single user. In my test, it left a few more shavings outside of the tray, so you may need to shake the whole thing in the trash. 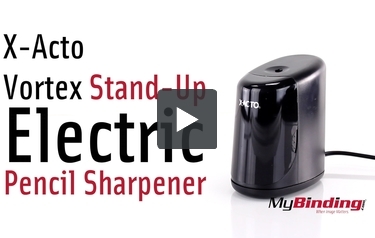 This is the X-Acto Vortex Stand-Up Electric Pencil Sharpener! It’s a unique design for a vertical pencil sharpener, and the bottom pads do well at keeping it from sliding around.